The tree-filled upper northwest neighborhoods of DC offer historic homes, the National Cathedral, cozy restaurants and great shopping. 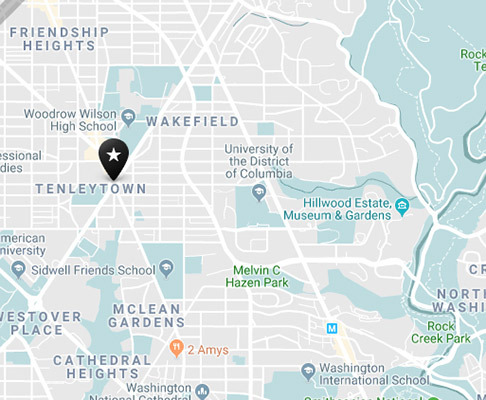 DC’s upper northwest neighborhoods, which include Glover Park, Tenleytown and the shop-filled Friendship Heights, offer glimpses of homes where real Washingtonians live (and lived). At the Washington National Cathedral, you’ll find gargoyles, serene gardens and a symphony of stained glass. Marjorie Merriweather Post’s lavish Hillwood Estate, Museum & Gardens shows off Russian Imperial treasures and impressive gardens. And Friendship Heights’ shops sell everything from designer handbags to imported housewares. The National Cathedral was completed in 1990, but its neo-Gothic flying buttresses, dramatic stained-glass windows and pointed spires suggest a far older church. Surrounded by a medieval-style garden, the intricately carved stone edifice has 100-foot ceilings, a serene crypt (Helen Keller and Woodrow Wilson are buried here) and, on its exterior, 112 gargoyles and 1,000 grotesques. Tours, weekly evensong and services are among the ways to explore the church, which, though Christian, was created as a house of worship for all faiths. Not far from the Cathedral, the lavish Hillwood Estate, Museum & Gardens gives a glimpse at the glamorous life of Marjorie Merriweather Post, a cereal heiress whose world-class collection of Imperial Russian artifacts and French furnishings fills the secluded mansion and its outbuildings. Fabergé eggs, paintings of the czars and gilt French furniture are among the highlights, and there’s a lush garden with roses, fountains and a pet cemetery. Glover Park, just north of Georgetown, holds bars and restaurants popular with locals and students. Try beachy Surfside for Mexican tacos, burritos and margaritas and a roof deck; snug Slate Wine Bar doles out Mediterranean fare and sustainably produced vino. Michael Schlow's Casolare, housed inside Kimpton Glover Park Hotel, serves up a delicious Italian menu for breakfast, lunch and dinner. And every Sunday, the neighborhood hosts the long-running Georgetown Fleamarket, an open-air bazaar where you can bargain for jewelry, art and vintage housewares. Right by the Maryland border, Friendship Heights features some of the city’s best shopping with department stores like Neiman Marcus, chain stores like J. Crew and a few local boutiques. Author readings at Politics & Prose Bookstore, looking for the Darth Vader grotesque at the National Cathedral, movie night at The Uptown Theater. Ride the Metro’s Red Line to the Tenleytown and Friendship Heights stops. Numerous bus lines also service Glover Park, including the 30N, 30S and D2 routes. Fine dining, a breathtaking cathedral, welcoming vibes – it’s all here in the Upper Northwest neighborhood. Get to know more about the luxurious and lavish side of DC by clicking the link below.